When I was growing up one of my favorite desserts was peaches and dumplings. It seemed a pretty simple recipe a large can of peaches tossed in a pot with biscuit mix (probably Bisquick) dropped by spoonfuls and cooked until it’s done. I know, a child’s memory only sees the end result. But served steaming hot with ice cream it was just delicious. You may know that our family has been gluten free for more than a decade. After lots of trial and error we have come up with a pretty reasonable lifestyle that does not include wheat flour or any of the other problematic grains. But even after all these years I had not been successful recreating a good biscuit or dumpling. Everything I tried would turn into a gooey, starchy blob that was not very appealing. Until this spring. We found a gluten free mix. Since I am highly recommending it here is the information: Made by Kinnikinnick in Canada, it’s called Kinni-Kwik Bread and Bun mix (in the Phx area I have found it in Sprouts). It comes as a Bisquick type mix with the flour, leavening agents, some sugar, etc. So it’s super easy to use. Measure out the mix, add your liquid and stir. Presto! Yesterday as I was poking through the freezer I came across a batches of peaches from last year. I wasn’t quite sure what to do with them; when it’s 115 out it’s hard to be motivated to turn on the oven. But the crock pot was sitting out so I decided to give it a try. I put the frozen peaches in the bottom with a little cinnamon and let them stew several hours. (I don’t think you’d have to do this but they were pretty liquidy and I thought would be better cooked down a bit.) Then I mixed up the Kinni-Kwik. I added just enough rice milk (you can use regular milk or other liquid) to make a smooth but fairly stiff mix (say it was somewhere between a cake mix and cookie batter.) I dropped the mix by the spoonfuls on top of the hot peaches, turned the temp to high, and put the lid back on. In about three hours they were perfectly done. The dumplings were amazing, moist and cooked all the way through. They absorbed some of the peach juice giving them a great texture and flavor. We let them cool a little (this is your only challenge as the smell permeates the house and everyone keeps walking into the kitchen to see if they are ready), then scooped them out and topped with our favorite vanilla ice cream (we use a lactose free brand). Yum… the ice cream begins to melt on the warm dumplings and adds a creaminess and the cold against the warm…Oh, it’s good. You wouldn’t believe it’s gluten free. I’d invite you over for a taste today but unfortunately it’s all gone. But let me know if you want to try some next time. It seems like we did nothing productive last week and yet we were busy every day. Right now it’s so hot here it’s time to stay in your house and not leave except to hit the pool… days where the temperature tops 110 are hard on everything and everyone. 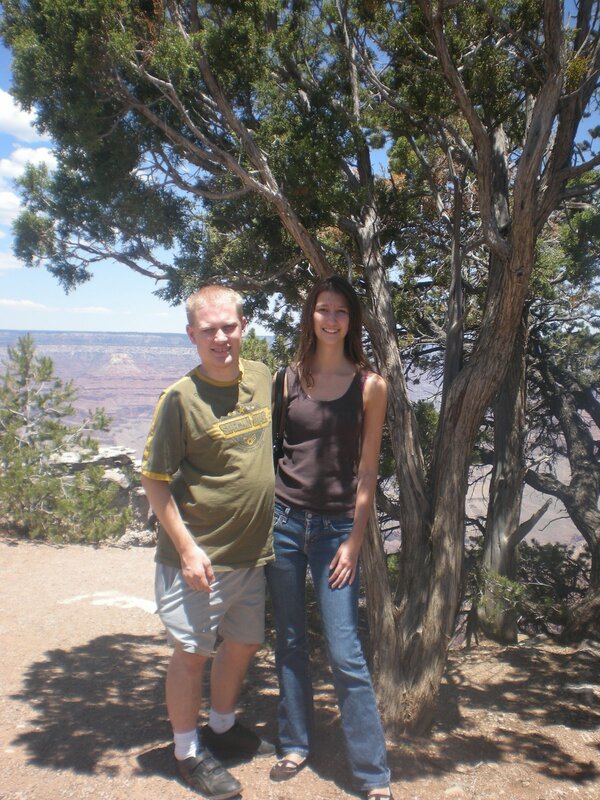 You know I read somewhere that the average tourist looks in to the canyon only 12 minutes. Can’t quite imagine since it is so amazingly different from each vantage spot and during the different times of day. Anyway, we drove all that distance and still managed to beat Bob home. We also took a fun mystery shop at a veterinarian’s office. Our dog needed her rabies shot so was chosen to come along. Talked a lot with the vet about her being old and cranky and he gave her some arthritis medicine. You won’t believe the difference it has made. Either she is feeling much better or just very relieved that we brought her home and going to the doctor wasn’t the end of the line. So this week the forecast appears to be more of the same. I think that means we’ll be staying home with blinds drawn drinking iced tea next to the fans and maybe watching Ice Road Truckers as we try to stay cool. My daughter tells me I am bordering on melancholy this week. So here’s something more uplifting. Grow where you are planted… Anyone who knows me well knows that this saying doesn’t seem to apply to me. I long to live where it’s green, rainy and cool. Yet here I am well over 25 years, in the dry, hot desert. Have you ever driven the I17 interstate? It’s a pretty straight road that connects the low valley of Phoenix to the high mountains of Flagstaff. I used to love driving it in the spring when I was at NAU. I would leave snowy winter in Flag and as the altitude dropped enter a desert, that in the spring was green and growing. Typical of Arizona the sun would be shining most of the time…although, I do remember having to detour through Black Canyon City because the highway bridge was closed when the normally dry washes were at 100 year flood levels… But I digress–that’s a story for another day. When you are heading south on I17 you drive across a fairly flat stretch before a dramatic drop down into the Black Canyon. The turns on this steep stretch may not be hairpin but the unsuspecting traveler is generally frightened enough to ride the brakes all the way down. It’s exciting enough for me…and I’m used to it. So, as you make the first big turn, if you are in the left lane you are right against the mountain. Each spring when I would drive through I would see it growing in the gravel and rock of the hillside. I couldn’t help but notice it, bright pink against the desert background and so very out of place. 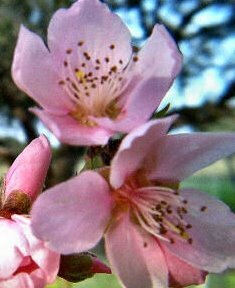 It was a peach tree with beautiful pink blossoms. Someone must have tossed the pit out as they were driving and against all odds it grew. Through spring into the hot summer and then the crazy Arizona winters it grew. Year after year I watched it grow. It was just amazing to see something this crazy tree on the hillside. If it’s not in bloom it’s hard to spot. And if you’re driving it’s even harder…I don’t actually recommend looking if you are the driver and careening down the hill at 70+ mph. Just take my word. So when I start to think about moving to Widby Island in Washington or Grants Pass, Oregon (which coincidentally happens when the temperature reaches 100+ here) I remember that peach tree. What are the chances that it could not only grow but bloom where it was planted? 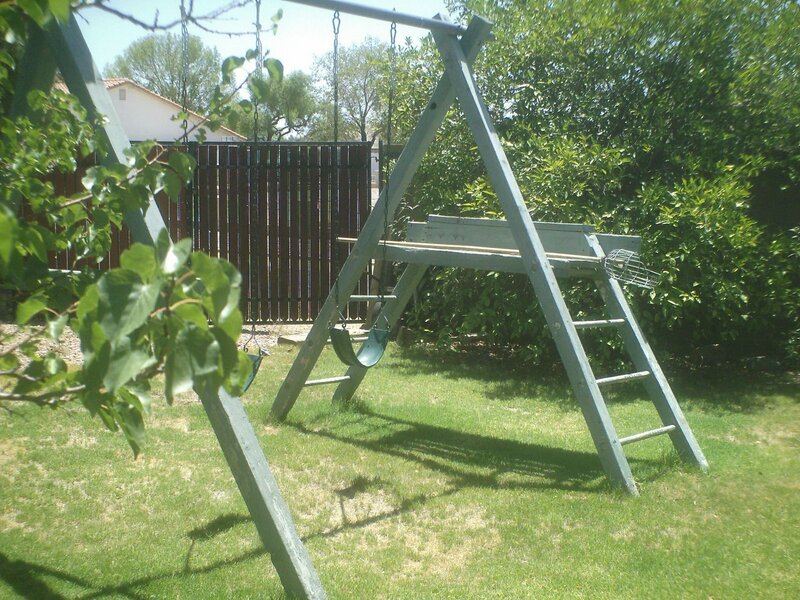 Our swing set has seen many changes over the years. Bob built it as just a simple swing when Matthew was small. It moved with us to this house and Bob added a slide when Rebecca was little. Then Rebecca thought she really needed a house so Bob added on and put a bigger slide off the side. What fun the kids had. Friends would come over and they would play for hours. Our crazy dog would climb up the ladder and use the platform as her higher view point while she protected the property. But darned if those kids didn’t grow and outgrow their interest in it. 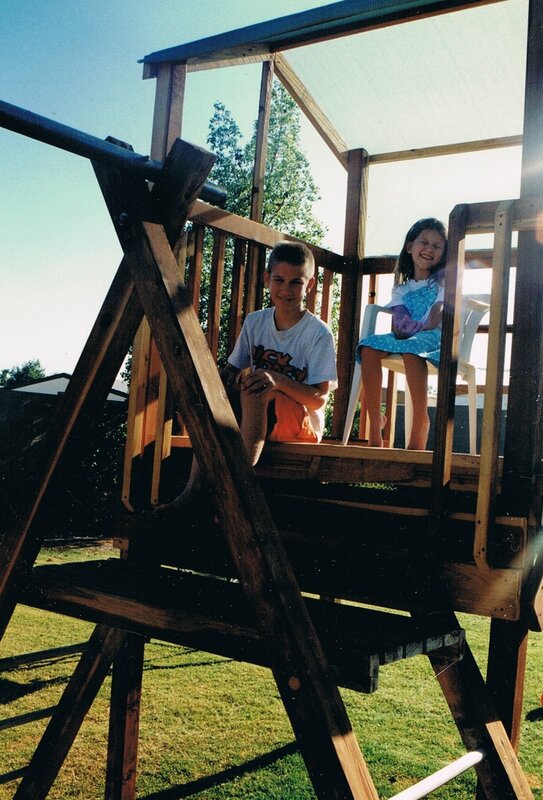 So a few years ago we took the well worn (and quite wiggly) play house off reverting back to the original swing. It was still used some until Matthew decided that he really didn’t fit on the swings. Bob didn’t think we (meaning he) were ready to take it down completely and instead decided a fresh coat of paint would help… But today it sits out in the far back yard…unused. And as I mow around it now we need to let go. Yes, it’s time.